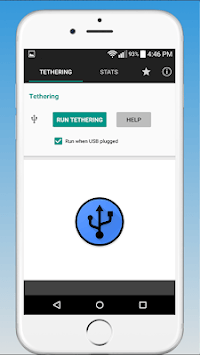 Usb Tethering Share is a simple application that shares Internet connection from your smartphone to your computer through usb connection. When you connect the phone to your laptop or computer, the application automatically starts. Then you can easily share Internet access through USB by clicking: Start USB tethering. The widget is active when the app is running and USB is connected. 2 data transfer rate widget. 3 automatic start when USB plugged. 4 register receiver for USB Power Plugged. You can easily share Internet access through USB by clicking: Start USB tethering.